What is the Best Yellow Jacket Trap? Are There Different Types of Hornets? If you’ve ever had one of your late-summer barbecues ruined by pesky yellow jackets, you probably have wondered how to keep yellow jackets away from your home. These uninvited guests are a kind of ground-nesting wasp that can become extremely aggravated when they feel threatened, leaving you vulnerable to a painful yellow jacket sting. While a few yellow jackets in your yard may be nothing more than a nuisance, a yellow jacket infestation can pose a real hazard, especially if you or someone in your family is allergic to the sting. 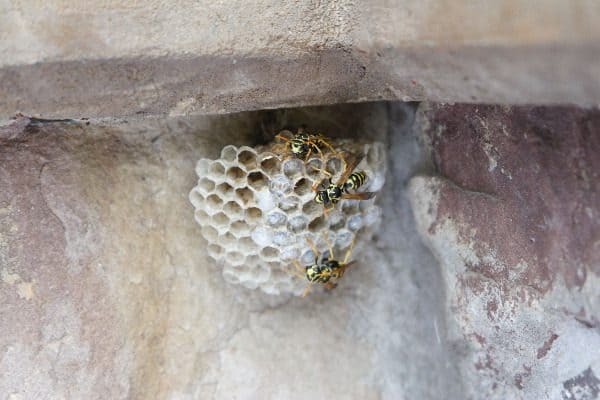 This article provides you several different ways of how to keep wasps away from your home and ways to get rid of yellow jacket nests successfully. 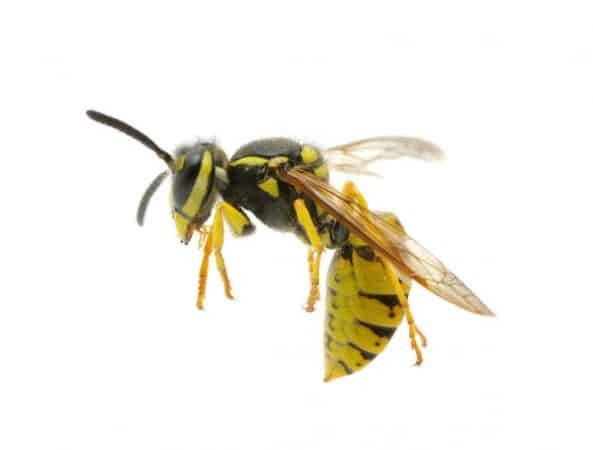 This article provides you several different ways of how to keep wasps away from your home and ways to get rid of yellow jacket nests successfully. The wormwood plant, also known as Artemisia, is a boxy shrub that is perfect for keeping yellow jackets away. You can plant these evergreen shrubs around the border of your house or patio for a yellow jacket free area. It’s a fantastic way of how to keep your house wasp-free. 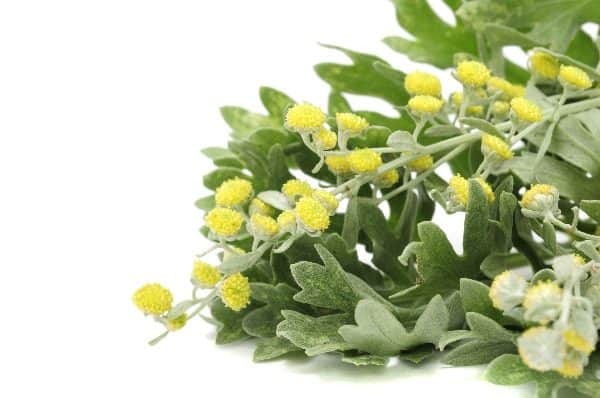 A word of caution, wormwood contains absinthe, which is a highly poisonous substance, so avoid planting other plants or flowers around the wormwood, and be sure never to ingest the plant. To keep yellow jackets and wasps away from your patio, without spraying harsh and toxic chemicals around the area, you can use fresh cucumbers to ward off these pesky insects. To accomplish this, cut a fresh cucumber into many slices and place them in a single layer on an aluminum pie dish. Put a couple of these plates around your patio to repel yellow jackets and wasps. Cucumbers work as a yellow jacket repellent because the cucumber reacts with the aluminum, giving off a chemical scent, undetectable to humans, that makes the wasps flee. Along with smelling good, spearmint is an easy to grow, yellow-jacket repellent. Spearmint is a spreading rhizome, so you’ll want to make sure to plant it in a place where it won’t become invasive. To help keep it from spreading, you can plant it in a pot with the bottom cut out and put the pot into a hole in the ground. Not only do yellow jackets stay away from spearmint, but they also seem to dislike any mint. Using peppermint oil as natural repellent is an excellent way to keep all sorts of pests like flies, spiders and wasps from ruining your outdoor space. The Journal of Pest Management and Science published a study in 2013 that reported great results with peppermint oil. Thyme is another plant that you can put around your house to deter yellow jackets from hanging around. Thyme is a perennial that is easy to grow and requires little maintenance. The best part of planting thyme is you can also use it to flavor your cooking. You need to plant the thyme in a place where it can get full sun, and avoid over watering the plant. Thyme, especially the oil of thyme, with its antifungal properties is also a wonderful home remedy to get rid of toenail fungus. Similar to finding ways to keep spiders out, essential oils mixtures work really well against yellow jackets. Combining lemongrass, geranium, and clove essential oils have shown to repel worker wasps completely. To keep wasps away from your outdoor living space, mix water, several drops of each oil, and several drops of liquid dish soap, in a spray bottle and spray in places around your house that you want to keep free from wasps. Depending on your climate and location, you can plant eucalyptus trees in your yard in mid to late fall or spring to help keep your yard free of yellow jackets. It is important that you water the tree both before and after you’ve planted it. Avoid spreading the roots out when you plant the tree, as you could damage their sensitive root system. Sugar water is a tempting treat for yellow jackets. Make sugar water traps and hanging them in areas where wasps like to gather. These traps work to attract the yellow jackets, getting them to fly into the container where they are not able to escape. You can make your sugar water traps in minutes with the instructions found below. If you grow fruit trees in container, it may be a good idea to set them away from the house, as they may attract yellow jackets and other flying insects. Wasps are extremely territorial creatures and will avoid any area where there is already a nest. To keep these pests away from your summer barbecue, create a decoy nest out of duct tape. Find the tutorial for making your wasp nest decoy below. Using the foam football, wrap the duct tape around it in a layered, spiral pattern. Poke a hole about ½” deep into the end of the football. Paint the inside of the hole with the black paint or marker to give it the appearance of greater depth. Attach the wire to the other end, or top, of the football. Hang the decoy where you want to repel wasps. The pennyroyal plant is amazingly effective at repelling yellow jackets and other unwanted insects. You can grow the rounded bush from seeds, cuttings, or a spring division. Make sure to plant them after any danger of frost has passed, and keep the plant bed moist. Due to the dangerous nature of removing wasps nest yourself, you’ll want to hire a professional to complete the task. However, if you want to attempt to remove the wasp nests yourself here are some great ways to accomplish the task. Before starting, make sure you have an escape route planned and always be sure to wear protective clothing at all times. Before starting, make sure you have an escape route planned and always be sure to wear protective clothing at all times. Spray the solution directly onto small, hanging nests. For larger nests, attach a hose-end sprayer to your hose and fill it with the same mixture of dish soap and water. Using soap and water is also an excellent method for getting rid of yellow jackets that have built their nests in the ground. The soap used in this approach clogs the breathing pores of the yellow-jackets, causing them to die instantly. Drowning aerial nests can be tricky and should be performed if you are allergic to yellow jackets because the risk of you getting stung using this method is very high. It is important that you wear protective clothing while using this method. The best time to complete this job is at night when the yellow jackets are less active and their reaction times are slower. To drown aerial nests, you will need to place a cloth bag carefully over the whole nest, and quickly seal off the bag at the top. Pull the nest free of the bag as you draw in the tie, making sure that the bag is sealed well. Place the bag in a bucket of warm water. Drop a large rock on the bag to ensure it stays submerged. Another way to get rid of yellow jacket nest is by smoking them out. Using the same protective measures, light a fire in your grill and place it just below the nest, or build a small, controlled fire below it. Allow the smoke to rise for at least an hour so the smoke can fully penetrate the nest, effectively suffocating the wasps and forcing them to flee. When you are confident that the nest is empty, you can carefully knock the nest down using a stick or other long object. Keep a spray bottle filled with liquid dish soap and warm water to use on any live yellow jackets that may still be around. You are probably most familiar with the yellow jacket nests that are found under the eaves of your house or in trees. But did you know that they also build their nests in the ground? A single nest can contain as many as 1,000 yellow jackets, who will aggressively defend their nests, emerging when threatened. Here’s how to get rid of yellow jackets in the ground and how to get rid of ground wasps. When trying to get rid of nests in the ground, make sure to try the following methods at night or on a chilly morning to ensure that they are relatively calm. Make sure to put on protective clothing before you try these methods. Mix equal parts of warm water and peppermint castile soap. You can also use a liquid dish or laundry soap. Using a flashlight, find the hole. Lay the flashlight on the ground, pointing the light toward the hole. Using a hose with a spray attachment or long-nozzle watering can pour the solution down the hole. Immediately pour boiling water down the hole to push the soap deeper into the hole. Yellow jackets and wasps love hummingbird feeders because of the sweet nectar water that hummingbirds love to drink. To keep wasps away from your hummingbird feeder, try these simple tricks. Purchase hummingbird feeders that are designed to deny wasps, and other pests like ants, access to the sweet sugar water. These kinds of feeders keep syrup levels too low for other insects to reach. Use hummingbird feeders that have mesh coverings that cover the feeding slots. Wasps and bees like to eat in the sun, so move the feeder to a shady spot in your yard. Reduce the sweetness of the sugar water, and the wasps and bees will eventually leave. Yellow jackets don’t consume nectar like bees. They like to eat the larvae of beetles, stink bugs and caterpillars. They also like to feed on sweet foods like fruits and the nectar water that you put in hummingbird feeders. When yellow jackets feel threatened, they become aggressive and are capable of stinging you multiple times. Whenever possible, you want to avoid coming near them or their nests. If a yellow jacket flies close to you, avoid striking it or running as these actions will provoke them to attack. Try to avoid crushing wasps against your body, as this will release an alarm pheromone that can prompt a frenzied assault. The most effective yellow jacket traps are ones that use an attractant to lure the yellow jackets into a durable plastic container. The Rescue Reusable Yellowjacket Trap is the most common trap sold on the market, and it is highly effective. It costs around ten dollars and can be picked up at any hardware store or the hardware section of your local grocery store. Another effective wasp trap is the Raid Disposable Yellowjacket Trap, which you can get online for under $20. These traps will attract all the major species of yellow jackets and is non-toxic. There are numerous kinds of wasps and hornets. Like bees, they help to pollinate different plants and flowers, and they eat different bugs and insects that feed on your plants. Either solitary or social insects, wasps often come out in the evening to feed. Here are some of the common wasps and hornets that you can find in Canada and the United States. Other pollinators like hummingbirds are an essential part of the eco-system, as well. Keep ants away from hummingbird feeders by spritzing a bit of cooking spray on the hook and cord attached to your feeder. Cut the neck of the two-liter plastic bottle off. Remove the cap of the bottle and flip the bottle upside down. Put the neck of the bottle into the opening that you just created. Tape the pieces together using duct tape. Rub the vegetable oil along the sides and edges of the trap, which prevents them from escaping because they aren’t able to get their footing, causing them to fall into the hole. Using the short piece of string, tape it to the top of the bottle and hang in an area where the yellow jackets tend to gather. While yellow jackets are essential to our ecosystem, they can quickly become dangerous pests, especially to those who are allergic. 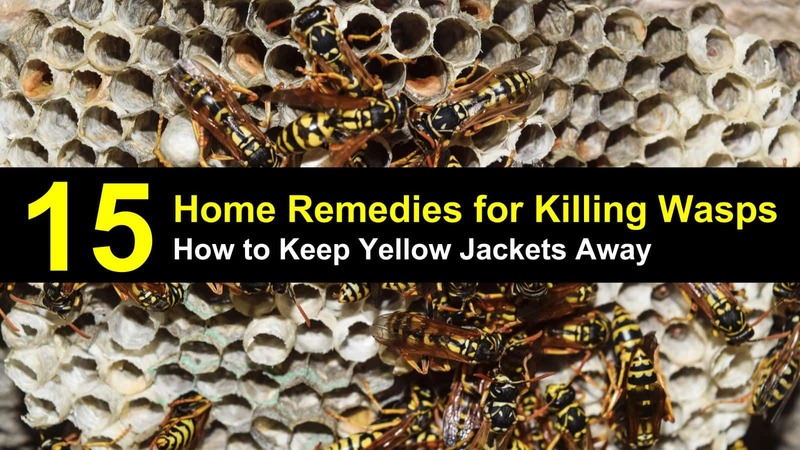 This article has provided you with several simple solutions to keep yellow jackets away from your home, while still allowing them to contribute to the environment. If you found the information in the article helpful, don’t hesitate to pass it along to your friends and family. If you want to enjoy your summer to the fullest, you’ll want to keep the yellow jackets and wasps away. After all, aggravating a bunch of yellow jackets and suffering stings during a family BBQ is an excellent way to turn a fantastic day sour. In this article, you learned how to keep yellow jackets away. 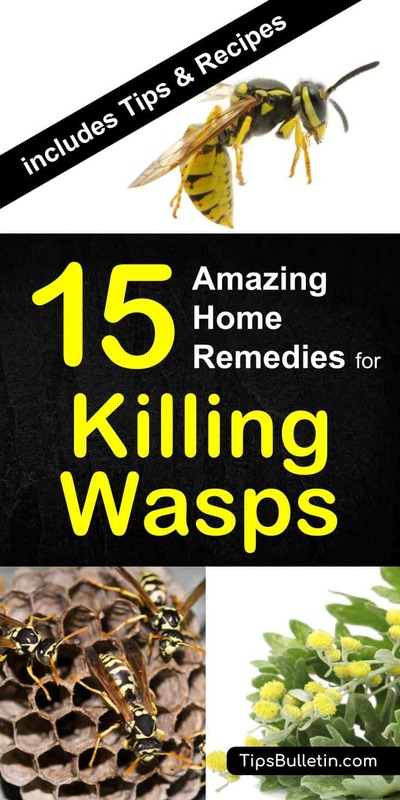 You also learned how to get rid of yellow jackets in the ground and some home remedies for killing wasps.